TORONTO – December 3, 2013 – The Canadian Interactive Industry Profile 2011 (CIIP), which provides an in-depth look at the interactive digital media (IDM) industry in Canada, was released today during Interactive Ontario’s X-Summit programming at nextMEDIA. 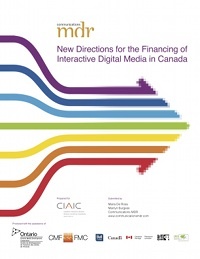 This report follows two previous editions of the Canadian Interactive Industry Profiles released in 2006 and 2008 but proposes a revised methodology that includes a more narrowed definition of the digital media industry to provide more of a focus on companies creating true “rich interactive experiences” (in terms of content creation) and those that supply services that directly enable other firms to create those experiences. Covering all Canadian regions and comprising data collected from big, medium and small companies through a national survey, this report provides an extensive view of Canada`s IDM industry. In addition to the key economic indicators found in the first chapter, this study also includes a chapter on human resources, training and skill gaps that can currently be observed in the IDM sector. Finally, the report provides a future outlook for Canada’s IDM industry. Interactive digital media companies in Canada appear to be poised for growth in the year or two following the report. Just over 80% of companies project at least 10% growth in revenue over the following 12-24 months and more than half (56%) project revenue growth of 25% or more over the same period. At the same time, there are a number of barriers that could hinder future growth. Core IDM companies in Canada indicated that a seeming lack of affordable capital is the most significant limiting factor for company growth in the industry, followed by the availability of management and sales expertise and the availability of skilled labour in general. ● Almost 57% of revenues generated in 2011 were directly related to export sales. ● Canada`s interactive digital media industry is concentrated in Ontario, British Columbia and Québec. The CIIP was commissioned by the CIAIC and created by Nordicity, with funding from the Cultural Human Resources Council, Canada Media Fund (CMF), Canadian Heritage, and the Ontario Media Development Corporation (OMDC). “Ontario’s interactive digital media industry is thriving and producing innovative cross-platform content that is attracting global interest, so we’re especially pleased to support research that will help to ensure the ongoing competitiveness of Ontario’s industry on the world stage,” said Karen Thorne-Stone, OMDC’s President and CEO.